Our Moose and Beaver safaris end late at night, so you will need to stay the night somewhere nearby. We don’t recommend you to drive several hours after a late night safari as we often finish late, and you are missing out on the local guesthouses and hotels. And there are no late trains or buses from Skinnskatteberg. If you would like to stay at any of these hotels, please contact them directly for reservations. Note that our multi-day tours already include accommodation. Kolarbyn Ecolodge has twelve huts. This is Botvid, #11. Each hut has two beds and a fire stove. We provide sleeping bags. Many of our guests choose to stay at Kolarbyn Ecolodge. It is called Sweden’s most primitive hotel! Why? Because there is no electricity, no showers, nothing fancy at all, just natural mysteriousness! And that is precisely why you are going to love this place! Udden is a guesthouse and sheep farm, located right by a lake. You can rent canoes and go for a paddle around the lake. This is the meeting point for our Wolf tours. A small and relaxed guesthouse by lake Storsjön. Your host Eva will take good care of you and Allan is cooking classical Swedish dishes with ingredients from their farm. We offer pick-ups for some tours, but you must inform us in beforehand by email. For Moose Safari our guide can pick you up here about 15-30 minutes after the starting time, as it is along the way. For Beaver Safari we ask you to drive to the starting point, but if you don’t have a car our guide can pick you up here about 30-45 minutes before the starting time. This is the main building at Färna Manor & Spa. The Swedish King stays here regularly. And this is where we do our Beaver Safaris. Nature is just around the corner. This large hotel is located between two lakes in Färna village. They have a nice spa, a culinary gourmet kitchen and a tea table with lots of sweets and hand made pastries. Their chefs uses products from local farmers and their own garden to create some amazing gourmet meals! The restaurant is certified by Swedish organic label KRAV, slow food inspired and chosen by Chaine des Rotisseurs and the White Guide. This is the starting point for our Beaver Safaris since May 2019. Transfers: For the Moose Safari our guide can pick you up here about 15-30 minutes before the stated starting time. You must inform us in beforehand by email. Location: In Färna village, less than 2 hours drive from Stockholm and 14 km East of Skinnskatteberg. Baggå skola has some basic rooms with has a lot of character. Each room is different, so are all cups and plates in the café. Amy and Thomas runs this place and our guests love them. Amy and Thomas will greet you with a big smile! This alternative countryside food cafe is based in an old school building. It has three basic rooms with a shared bathroom and chickens ranging free in the garden. Save some room for the cakes and cookies that come with inspiration from all over the world. We can pick you up here for some tours, but you must inform us in beforehand by email. For the Moose Safari our guide can pick you up here about 15-30 minutes after the stated starting time, as it is along the way. For the Beaver Safari we ask you to drive to the starting point, but if you don’t have a car our guide can pick you up here about 30-45 minutes before the stated starting time. Location: In Baggå village, 11 km North of Skinnskatteberg, close to Pensionat Udden. Ulvsbomuren is a small sheep farm in the forest. This is one of the rooms. This is a charming farm out in the forest with accommodation in two old traditional timber cottages. There are ten beds but only one group stays here at a time no matter if you are two persons or more. The owner Hellen has made great efforts to use old buildingmaterials and to keep the old charm. The food is great! Transfer: You need a car to get to the starting point of the moose and beaver safaris in Skinnskatteberg, a 30 minutes drive. Location: In the forest near Ramnäs, 27 km East of Skinnskatteberg. A wooden hotel by stream Hedströmmen. A charming guesthouse by river Hedströmmen in Kolsva village, now with new owners. Transfer: You need a car to get to the starting point of the moose safari (30 minutes drive) and beaver safari (25 minutes drive). Location: In Kolsva village, 32 km South of Skinnskatteberg. You can get here by train and bus. Just a place to sleep, with walking distance from Skinnskatteberg station. This classic hotel from 1950 is under new ownership and restauration is on-going in the main hotel. The newly renovated Annexet, the smaller hotel, has 6 basic rooms (17 beds in total) with 3 shared bathrooms and offer breakfast and free Wifi and parking. For the Moose Safari our guide can pick you up here about 15 minutes after the stated starting time, as it is along the way. Location: In Skinnskatteberg, 300 meters from the train and bus station. Price indicator: From 350 SEK per person in a double room with breakfast. This hotel is great if you are just looking for a room for the night. Each room has a TV, wifi and bathroom. Breakfast is included. The building is not beautiful in any way, but the large lake and forest is close by. Transfer: Located 5 minutes drive from Kolarbyn Ecolodge which is the starting point for our Moose Safaris, and 15 minutes drive from Karmansbo which is the starting point for our Beaver Safaris. We can pick you up here at request. Location: In Skinnskatteberg village. You can easily get here by train and bus. Price indicator: 800 SEK for a double room, 550 SEK if you travel solo. 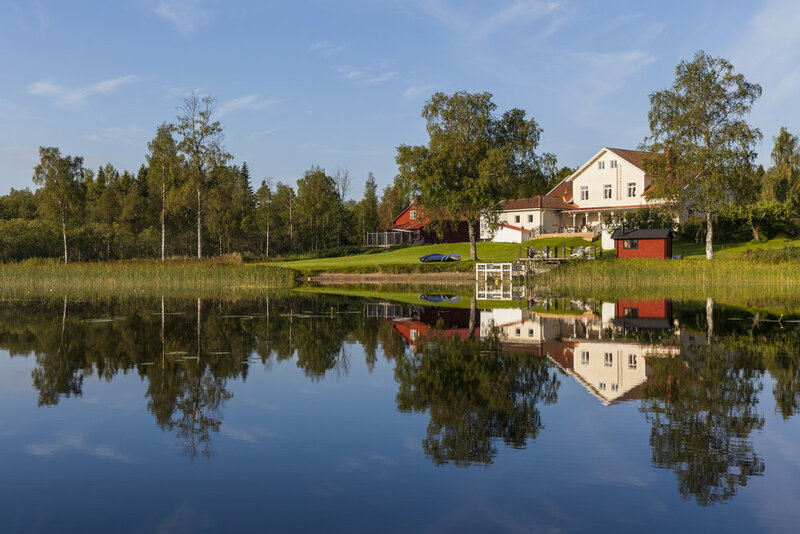 There are plenty of private houses and cottages to rent within one hours drive from Skinnskatteberg. There are plenty of nice private houses that you can rent in the area. Airbnb is a site that lists private places to stay, some of them near Skinnskatteberg.